SK Usman, Abuja: In continuation with the clearance operations of the remnants and fleeing members of Boko Haram terrorists group, troops involved in Operations LAFIYA DOLE and HARBIN KUNAMA II have intensified the tempo of their operations in their various areas of operations. The troops of 232 Battalion yesterday carried out patrols to Muchalla, Lade and Bodeno villages in order to prevent Boko Haram terrorists’ infiltration. Similarly, troops in blocking position at Garkida carried out similar exercise to Dzangwalla general area where they neutralized fleeing Boko Haram terrorists. On their part, troops of 23 Brigade Support Battalion conducted patrol to Kolkol village with the aim of dominating the area and preventing elements of Boko Haram terrorists infiltrating the area through borders with neighbouring Cameroon. Whereas the troops stationed at Forward Operation Base at Hong have assumed blocking positions in Mararrabar Pella, Kalaa and Shangui to dominate the area and fix any Boko Haram terrorists that venture that way. The troops of 27 Task Force Brigade on the other hand, following tip off from well meaning Nigerians, yesterday arrested a suspected Boko Haram terrorists informant and collaborator, Alhassan Garba, at Azare village, Gujba Local Government Area of Yobe State. Preliminary investigation revealed that the suspect’s daughter, Lami Alhassan Garba is married to a confirmed Boko Haram terrorist, Musa Isah, who fled from the village to Kano and was subsequently tracked and apprehended in Kano city. Both are currently being held for further investigation. Troops of 233 Battalion in conjunction with elements of 29 Task Force Brigade and 212 Battalion have also conducted clearance operations where they successfully rid Lawanti village of Boko Haram terrorists. Similarly, troops of 154 Task Force Battalion, 29 Task Force Brigade, have also conducted fighting patrol along Mauli-Alagarno road with a view to dominate the area against infiltration by fleeing Boko Haram terrorists. The unit has also carried out patrol to Sansan village and Bulabulin to prevent Boko Haram terrorists’ infiltration. 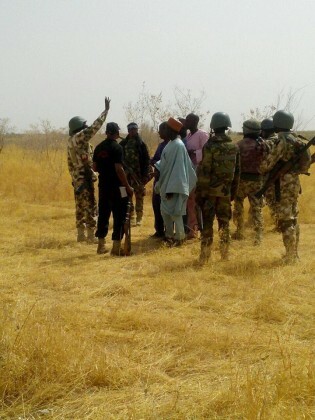 Troops of 156 Task Force Battalion of the same Brigade have also carried out patrols along Ngula-Jayiwa and Kukuram-Abalam axis to deny fleeing Boko Haram terrorists from crossing over to other areas. The 29 Task Force Brigade Defence Company and Quick Response Force carried out massive joint clearance operations with troops of 27 Task Force Brigade and 212 Battalion. 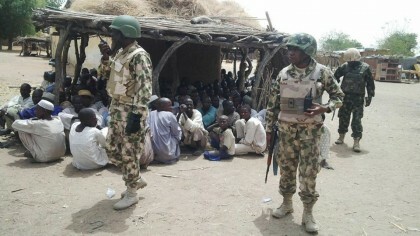 The troops of the various units and Forward Operating Bases of 33 Brigade Nigerian Army have also been carrying out patrols to Lame, Bingel, Gumau, Toro, Panshanu, Tashan Kaji and Tashan Durumi. Others include Sabon Gari, Yelwan Duguri, Darazo, Soro, Wailo, Drum, Bukutumbe, Dogon Ruwa, Dingis, Dabar Baga and Gomo, among others. Similarly, the Brigade is involved in Operation HARBIN KUNAMA II in some forests within Bauchi and Gombe States with tremendous success. The troops of 231 and 331 Battalions stationed in northern Borno have also been maintaining blocking positions, carrying out patrols, raids and ambushes within their areas of responsibility.